What comes to mind when you hear the word Miracle. Savior – Performed Miracles as told in the Bible. Patsy – Car wreck, head on collision that could have easily taken her life and yet she survived with a serious broken ankle which required extensive surgery and a bad sprain on her other ankle. Both feet are in boots and she cannot put any weight on the one they operated on for 6 to 8 weeks. But she could have been killed. It is a miracle and a blessing that she is still here with her family and friends who she loves to serve. My Life – I have learned through my life to recognize the many tender mercies that my Father in Heaven blesses me with and realize that many of these are miracles. Elder Falabella – In December shortly after we received our mission call we received a telephone call from the Missionary Training Center in Provo regarding language training. We had been told that our mission would be English speaking and now we receive a call inviting us to learn Tagalog. We began working with them but were very concerned about the time they were asking for. You see we are not retired yet. We are working until we leave on our mission. The language training asked for 2-4 hours per day in personal study. 1-2 hours per week with a learning coach. 1-2 hours per week with a language tutor and another 1-2 hours per week with a study buddy. Add that to all the hours we were working with our business and preparing to leave and there were not that many hours in a week. However we started out with them and said we would do the best we could. After a couple of Skype sessions and some personal study I was in my office one morning when the phone rang. It was Elder Falabella from the Quorum of Seventy. He is one of the Seventy that is over the Perpetual Education Fund and Self-Reliance initiative. He was asking me about our call, how we felt about it, telling me about the people and the work when all of a sudden he changed the subject and said, "and don't worry about the language. You can do everything in English" and then went on with the previous subjects. His phone call and what he said was an answer to an unasked prayer. Heavenly Father knew my concern and answered it. God is a God of miracles. Every day. If you pay attention and consider your life thoughtfully and prayerfully you will notice that there are many miracles in your own life just as there are in mine. Knee Surgery – A number of years ago I needed to have surgery on my knee. I was concerned about it and asked my son Allen to give me a blessing. Allen blessed me and said "you will have no pain" I remember thinking, you can't say that, there is always some pain with surgery. However, I had faith in his faith and had no pain. I did not take even one pain pill because I followed the law and asked for a blessing and had faith in that blessing..
Cathy and I have had so much that needed to be done to get ready to serve this mission in the Philippines. We have had 6 months to prepare but we have not retired yet… we are working until we leave… that makes it difficult to get everything done that needs to be done. Again, we have exercised our faith, done everything that we could do and left the rest up to the Lord. Lots of miracles here, finances, getting things done at work and at home, and health. We have been healthier than any time during our life. I do not remember ever going through a winter without getting a cold or 24 hour flu, but neither of us has even had a sniffle during the past 6 months. Self-Reliance – Budget, first line of budget is Tithes and offerings, how can that be first when we are asked to pay 10% of our increase. Because you exercise faith to pay tithing on what your self-reliance income is and the Lord will open the windows of heaven as he promises in Malachi 3:10. That is how we have paid our tithing for the past 30 years and it is true. This is a principle that we will be teaching to the people in the Philippines who are striving to become self-reliant. As we have prepared to serve as Self-Reliance Missionaries in the Philippines, we have indeed received many blessing and miracles from our Father in Heaven. As I reflect on the many tender mercies received I am reminded of a scripture. D&C 84:81 Therefore, take ye no thought for the morrow, for what ye shall eat, or what ye shall drink, or wherewithal ye shall be clothed. Miracle of Friends – I would like to take a few minutes and tell you about 4 of my lifelong friends that have blessed my life. Most of us go through life with a handful of really close, lifelong friends. It occurred to me a number of years ago that each of these friends are all gifts from God to me. When I was in the Air Force in Colorado I was asked to be home teacher to George Breakall and his family. George was not a member and his wife was only semi active as were their 6 children. I quickly became friends with George and we have been best friends for over 40 years. I have seen him join the church and take his family to the temple. I have seen many of his grandsons and granddaughters serve honorable missions. In 1978 I got out of the Air Force and moved back to Salt Lake. I then met Dan, another lifelong friend who has been there for me and my family. We have shared more experiences together than I could ever list here. Suffice it to say that Dan is family and a friend who exemplifies the Savior as he has been of service to my family in ways he may never know. When we moved to South Jordan I met Steve. Steve was not a member of the church and did not have much interest in the church. We became best friends as we did everything together from putting in lawns and fences to fixing broken water pipes in the middle of a cold winter night. We went to dinner together, enjoyed each other’s homes and just became best friends. Steve was always there to lend a helping hand with any project I needed help with, and I assure you I needed a lot of help. Then Steve’s Dad died. Then the spirit whispered to him and he knew he needed to become a member of the church. Steve is still providing service to me as he comes over and visits me in my office several times a week and is always there to listen when I have a problem and need a friend. I have many other friends, many of whom have come to show their support today for our mission call to serve in the Philippines. All of my friends have touched my heart and made me a better man by their examples of friendship, kindness, and service. 45 years ago this month I entered the old Salt Lake City Mission home where the Conference Center sits today. In those days, that was the MTC and that is where I met Gary. 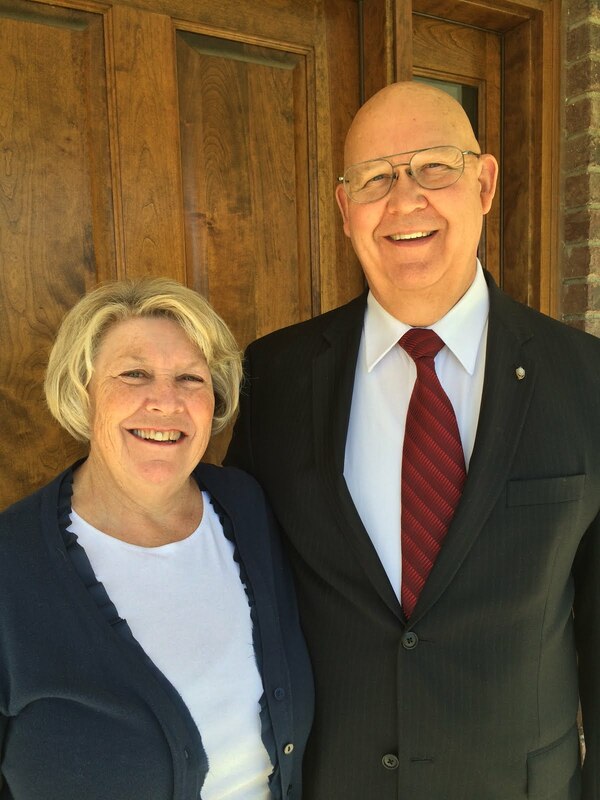 We were what today would be called MTC companions and we were going to England to serve as missionaries. We became best friends as we served our missions in England. That friendship has continued as we have raised our families together and shared each other’s good times and struggles for the past 45 years. 16 years ago Gary and I took our families on a canoe trip down the Green River. We started the trip at Green River Utah and went to Mineral Bottom, west of Moab. A beautiful 4 day trip of about 68 miles. Now before I go further I need to tell you something personal about myself. Many of you will find this hard to believe but here is my confession. I am a very stubborn man. When I was a little boy, I was a very stubborn child. Fortunately I had a stubborn Mom who knew how to teach me. I have also been blessed with a Heavenly Father that knows me as he knows each of you. Just as we know our children and know what they will do in certain circumstances, He knows what I am likely to do. Now with that in mind, let’s go back to the river. On the second day down the river, the water was very calm, smooth water. About midday most everyone stopped for lunch and to stretch their legs on a beach. Jessica was sharing a canoe with me and when we started to shore she cried that the mosquitos were too bad and said she did not want to go in. So we floated a little further down the river where we found a place in the shade of the cliffs and stayed there in the canoe to have our lunch and rest. It was cool there, no bugs and totally calm so we laid back to take a nap. At some point I took off my life jacket and used it for a pillow. (Bad idea… more to come on that subject) We stayed there about an hour and then took off when everyone else came along. We were bringing up the rear with Gary right in front of us. Gary realized we were almost to "River Register" at approximately mile 77.5 where people have written their names for years and years back to the time of Powell. Gary wanted to stop and hike to river register so he started yelling at everyone to go to shore. Everyone was in the middle of the river and had to turn the canoe sideways across the river and even paddle a bit up stream to get to the shore. I told Jessica that we should take a more direct approach (bad idea number 2) so we started to angle directly to the beach. When we got close to shore we saw that there was a big rock sticking out of the river a little so we tried to get past it on the side away from the shore but we were way too close to it. When we got to the side of it the current grabbed our canoe and sucked us sideways and promptly turned the canoe upside down throwing us out into the water. Remember the life jacket? Well it was still on the seat right in front of me but no big deal I’m a good swimmer, I have no shoes on to weigh me down, I have a cotton tee shirt and cotton Dockers so I can swim easily. Everything is tied in the canoe so again no big deal. My oar is not tied and is floating right in front of me so I grab it and start swimming to shore. Jessica is yelling something about my life jacket and is trying to pull it free from the canoe. All of a sudden I am going down in the water. That eddy is churning and sucking on the downstream side of that rock and it wants to take me to the bottom. I am kicking and swimming as hard as I can but I can’t get my head above water. I manage to get my head up about twice for quick breaths and as I go down the third time I’m thinking, If I don’t get up now I am through. Now after it is over I am told that Allen was on shore and already took his jacket off to go hike to register rock. He runs and jumps in after me with no jacket. Luckily Kyle saved me before Allen had a chance to get sucked into that eddy. I know that Heavenly Father knew I would do something stupid that day and he helped a 13 year old boy learn to kayak and prepared him to save my life. I heard him clearly tell me to grab on. I didn’t hear anything else but I heard that! I learned a lot about life that day. Just as the water in the River appeared calm and tranquil, it had power beyond my comprehension. Our lives are often like that, things may seem calm on the surface, temptations may look good on the surface but the dangers are there when we succumb to the enticements of the adversary. It is important to learn from our mistakes like this. My daughter Rebecca gave me a bookshelf made from a canoe after this trip. It stands in the corner of my family room as a reminder to grab on, wear a life jacket at all times. I know that he knows me personally and that he knows you. I know that miracles happen every day. I know that each of us can be the answer to someone’s prayer, that we can be the miracle in their life. Just as Kyle was not the biggest or strongest, we don’t need to be either. We just need to be willing to serve. If we pray daily to be the answer to someone’s prayer then we can be inspired to know who is in need of our help. When you receive a prompting to do something for someone, do it. I have received so many blessings in my life, so many miracles, so many acts of kindness and service that I feel blessed to have the opportunity to go to the Philippines with Cathy to serve. I am so blessed to have Cathy as my Eternal companion, I want her to know how much I love her and appreciate all she does for me and our family. Riley, Because I have been given much, I too must give. We must serve to show our love and appreciation to the Lord Jesus Christ for all the blessings we have received. If we are following the Lord then we must have our hearts and minds in focus with the Lord’s heart and mind. We know that the Lord’s focus is upon our eternal rewards and helping all our Father in Heaven’s children gather again with him. That is God’s plan. The Gospel of Jesus Christ is the path that leads us to our Heavenly Father. Are we exercising faith and following the Lord? Are we keeping our eyes on eternal rewards- or do we sometimes get distracted and focus on something else? Have you heard the story about the archaeologist who was trying to maintain his sense of direction down a winding river by watching the North Star? He watched the skies constantly but sometimes the view of the star disappeared behind the silhouettes of the trees lining the riverbanks, but it always reappeared shortly. At one bend in the river the star was lost behind the treetops again. As the boat turned he quickly relocated it and felt rather proud of his ability to stay oriented. After a minute of watching it, he realized he was mistaken: he had not relocated the North Star. In fact it was not even a star at all. He was watching a firefly. How could he mistake a miniscule firefly for a star of almost infinite brilliance? The light of the firefly rivaled the star because the fireflies were just a few feet away and the stars were so distant. There are so many fireflies in the skies and that is not a bad thing because God created the fireflies. UNLESS we let them become our compass, directing us to worldly wants and not eternal goals. Theron and I love our family dearly. Our eternal goal is the same as our Father in Heaven. We want an eternal family. We don’t let much get in the way of the time we spend with them now, so leaving them for a year and a half seemed unimaginable. In fact many of you have commented that you didn’t see Theron and I as ones who would go on a mission because our family was so close. Everyone thought we wouldn't be able to leave our children and grandchildren. That however is what gives us the reason and strength to go. I want you to hear the response of one of our grandchildren on the day when we received our call. Megan turned 10 last month. She gave us this card as soon as we opened our letter and read our mission assignment. I had Megan read the card that she had made for us. I am so glad you made the choice to go on a mission. You are a great example to everyone. You are the best grandparents a girl could ever have. I’m proud of you for serving the Lord. You are going to be the light in peoples world. You are following Jesus’ example which makes me the happiest child on earth. I will miss you a lot, I’m sure everyone will. Now you know HOW we can choose to leave them and serve the Lord in the Philippines. We are told that it is the time for us to declare our faith in God’s eternal plan, to follow the path of our brother Jesus Christ and teach his gospel unto this generation. We are told that if we accept this with all our heart, we will be provided for and our family will be blessed. We will be blessed with the promise of being an eternal family and that our Father in Heaven will prepare a place for us in heaven while we do his work here on earth. It is our privilege to feel the love Heavenly Father has for us and for our brothers and sisters as we assist in the work in the Philippines, the work of helping them come to themselves and more important, to come to God. “There is a law, irrevocably decreed in heaven before the foundations of this world, upon which all blessings are predicated— And when we obtain any blessing from God, it is by obedience to that law upon which it is predicated.” This is found in the Doctrine and Covenants 130:20-21. We become converted as a result of our righteous efforts to follow the Savior. Exercising faith is required for us to receive our righteous desires. These efforts include following Jesus Christ. We exercise faith when we are obedient to the lord’s teachings. Along with the teachings we receive in church and from the leaders we also are taught by the Holy Spirit. Are we obedient to the teachings of the Spirit? Do we follow the promptings when we receive them? Do we even recognize when we receive these promptings? Back in the middle of September Theron walked into the house, stopped in the kitchen and firmly announced "I think we should be walking on the beaches of Fiji teaching the gospel". Something in his voice made me turn and ask "are you serious?" His answer shocked me even more when he said "maybe I am". The rest of the day went on with talk of a mission being the dominant subject of conversation. The spirit was so strong in our home that day. We left the next morning for a weekend drive to Colorado. All the way there and all the way back we read the information on senior missions. We described to each other what we would like to do as missionaries. When we got to the part on the senior bulletin about the PEF Self reliance mission we knew that was what we were going to do. It was written out almost word for word as we had described our desires. After one phone call to the church office department presiding over missionaries we were on our way. Theron told the gentleman on the phone why he was calling, including the phrase of teaching in Fiji. The brother answered by saying we just sent a couple to Fiji to do that very thing. Again we felt the spirit confirm that this was what we were to do. Remember the scripture I said in D&C 31: 3 Lift up your heart and rejoice, for the hour of your mission is come. We received the confirmation that we had been prompted by the Spirit and that the Holy Ghost had indeed testified that the time for us to serve a mission was NOW. We exercise our faith through prayer and through sharing our testimonies. We share our testimonies not just through words but by our actions. We become converted when we live the gospel and become “doers of the word” by exercising faith, being obedient, lovingly serving others, and following our Savior’s example. When we act with integrity and do what we know is right we receive the peace promised by the Savior as we show Him we are willing to obey and follow Him. Some may think we are foolish to walk away from our business years before we are ready to retire, but when we calculated earthly things on the Lord’s timetable it made perfect sense to go now and let him take care of us. If we have been attentive and obedient to the Lord’s teachings and the admonishments of the Prophets to be debt free and self -reliant then it is easy to be obedient to the promptings of the spirit when he says “today is the day”. Let me quote Elder D. Todd Christofferson “As we walk in obedience to the principles and commandments of the gospel of Jesus Christ, we enjoy continual flow of blessings promised by God in his Covenant with us. Those blessings provide the resources we need to act rather than simply be acted upon as we go through life. Obedience gives us greater control over our lives, greater capacity to come and go, to work and to create.” Close quote. At an early age I was taught that I have a Heavenly Father who knows me and loves me. I came to understand that my prayers are answered. So when I was older and started learning the teachings about the restoration of God’s church it was easy for me to believe that God answered Joseph Smith’s prayer. In believing that Joseph’s prayer was answered it was easy to believe the Book of Mormon. I was taught to have faith and that through obedience to the teachings I would gain knowledge. I can now say I know that the Book of Mormon is true. I know that Joseph Smith was a Prophet of God, called to restore the Gospel so that we might receive the blessings that had been promised in our Fathers presence. I know that our Heavenly Father loves us and provides guidance for us today just as he did in the days of the Old Testament. He sends prophets to speak to us just as he did with his children he loved in ancient times, and he will continue to bless us and guide us but he will never take away our agency to choose for ourselves. Each day is an opportunity for us to show our Love to Our Heavenly Father and His son Jesus Christ. Through our obedience, our acts of service, our charity to others we are able to give thanks to them. I know that God is my Father, he loves me and he wants me to be happy. If I put my trust in him and keep my focus in line with his of being worthy to attend the temple and receive the sealing ordinances I will gain the greatest blessing from God which is eternal life. In the middle of September Theron walked into the house, stopped in the kitchen and firmly announced "I think we should be walking on the beaches of Fiji teaching the gospel". Something in his voice made me turn and ask "are you serious?" His answer shocked me even more when he said "maybe I am".